Imbolc, celebrated February 1st, marks the middle of Winter and holds the promise of Spring. It is a time of spiritual purification and dedication, and new beginnings. Build a sacred fire, light an altar of candles, reflect and honor your vows and the spiritual commitments you’ve made. Enter your temple of light. 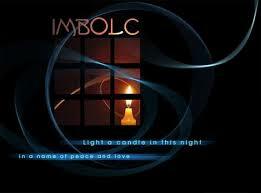 Imbolc is also called Saint Brighid’s Day where we honor and ask for blessings from the Goddess Brighid. Brighid we invoke your name. Source of healing, song and art. Love, Light and Faerie Dust ¨`*.✫*¨*.¸¸.*¨`*.✫*¨*¨`*.✫*¨*.¸¸.*¨`*.✫*¨*.¸¸.*¨`*. This entry was posted in Blessings & Rituals and tagged brighid, Candlemas, goddess, Imbolc, sabbat, saint brighid.